Caroline Kennedy, Ambassador of the United States of America to Japan, and Reiichiro Takahashi, Ambassador and Consul General of Japan in New York, planted a cherry tree at Brooklyn Botanic Garden today. Both ambassadors serve as honorary co-chairs of the Garden’s Japanese Hill-and-Pond Garden Centennial. The tree, Prunus ‘Snow Goose', which produces delicate white spring blossoms, was planted along the Japanese garden’s path just north of the viewing pavilion. This garden, designed by Takeo Shiota, opened to the public in 1915. Sarah Schmidt edits BBG's editorial content, including the blog, how-to articles, and the Guides for a Greener Planet handbook series. I’ve always been impressed with our Japanese Hill-and-Pond Garden. Throughout the years as a BBG Garden Guide in the Education department, having given tours to both children and adults, everyone has felt the same way: impressed. Here’s to another “One Hundred Years” and counting. Please keep your comments relevant to this article. Comments are moderated and will be posted after BBG staff review. Your email address is required; it will not be displayed, but may be needed to confirm your comments. Can You Predict When the Cherries Will Blossom? 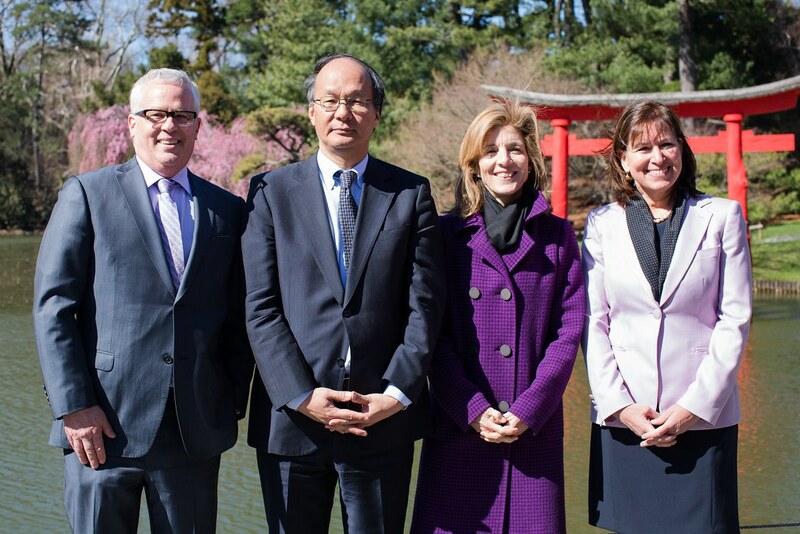 Brooklyn Botanic Garden president Scot Medbury, Ambassador Reiichiro Takahashi, Ambassador Caroline Kennedy, and BBG board vice-chair Diane Steinberg in the Japanese Hill-and-Pond Garden to celebrate the planting of a cherry tree. Photo by Liz Ligon. Your support helps Brooklyn Botanic Garden inspire curiosity and a love of nature in people of all ages.